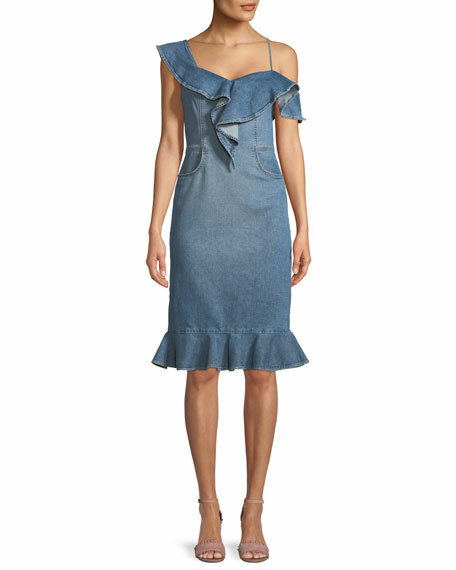 Jonathan Simkhai classic denim dress. 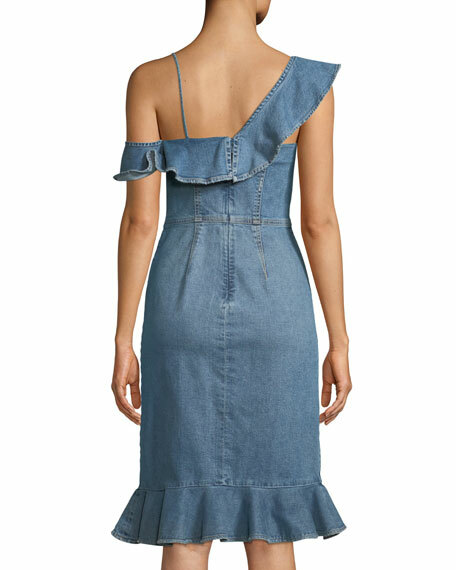 One-shoulder neckline with ruffled overlay. New York born and raised, Jonathan Simkhai designs for the urban sophisticate. With the launch of his eponymous line in 2010, Simkhai introduced a modern woman's wardrobe characterized by menswear influences, feminine silhouettes, and intricate fabrications. The result is effortless design with a forward-thinking twist. Simkhai was inducted into the CFDA Fashion Incubator program in 2014, a program designed to support the next generation of fashion designers in New York City, he then went on to win the prestigious CFDA/Vogue Fashion Fund in 2015. For in-store inquiries, use sku #2478181.